In one of the New York Stock Exchange's (NYSE) most anticipated days ever, social media giant Twitter rang the opening bell on Wall Street to market its initial public offering on 6 November. 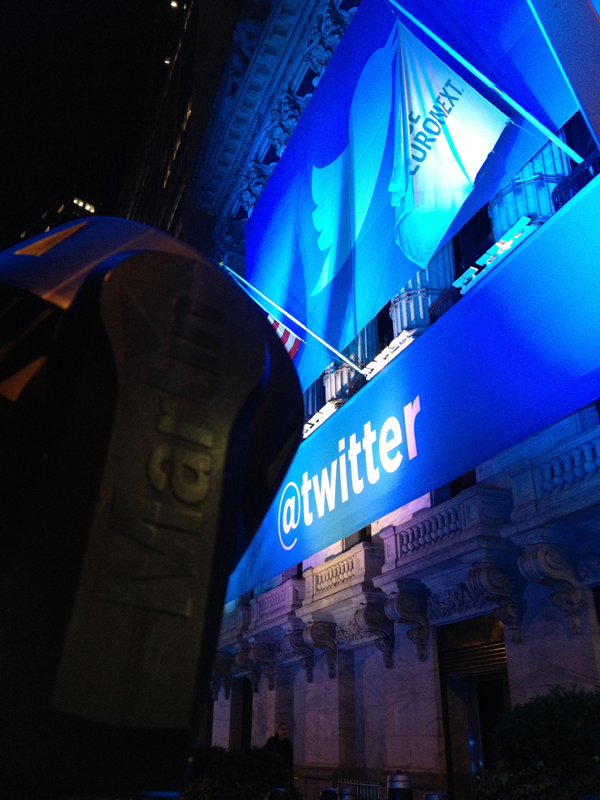 A lighting display featuring Martin Professional lighting fixtures, provided by See Factor, brightened the façade of the NYSE with Twitter's globally recognized logo the entire day. Rental company See Factor designed the system for the NYSE façade with Martin's MAC 2000 wash lights - the standard See Factor uses for events at the NYSE. For most NYSE events, a full crew installs the system with additional generators during the prior evening. However, for the Twitter event, Michal Ahern of Michal Ahern Production Services requested See Factor use three 20-amp outlets in the NYSE lobby, rather than bringing in additional generators, and setting up and breaking down the day of the event. The solution: See Factor secured 18 Martin MAC Auras and eight 2000's to a pre-rigged truss for a streamlined setup. The trusses rolled into place, with each sled powered by a dedicated outlet in NYSE. The façade remained lit on opening day well after the closing bell, until 10:00 PM. "The zoom capabilities of the Aura's gave us even coverage from top to bottom," stated Alban Sardinski, See Factor. "Because of the Aura's minimal power draw, we had room left over to add additional gobos on each rig to shine the Twitter text and NYSE logos on the façade. The entire system performed well, with no problems all day."